Despite having a taste for horror movies and novels, horror video games freak me the hell out. Still, I was curious about Resident Evil 7's promise of a Southern Gothic zombie game. Like millions of other scaredy cats out there, I decided to watch it on YouTube instead of playing it. Horror games are huge on YouTube, and popular YouTubers such as Pewdiepie, Jacksepticeye and Markiplier are all playing the game. I understand why people like these guys: they’re broadly funny, they have extreme reactions and are willing to embarrass themselves on camera. It’s also way easier to watch someone else be scared. But I’m also a nerd who was interested in the plot. I didn’t want to be distracted by screaming when I wanted to untangle the premise: why did Ethan Winters’s wife tell him to come to this Louisiana swamp? Who are the Baker family? How did they end up as horrifying, deformed zombies? It might sound like I was in the market for a commentary-less LP, but those have their own set of problems. It’s easy to get distracted if I can’t see someone reacting to scary moments in the game, but more importantly, the game wasn’t as scary. The benefit of a Let’s Player is that they can telegraph key moments to you, allowing you to be in the same headspace, and that’s an important part of the experience on YouTube. I settled on YouTuber Christopher Odd. It’s not as if Odd wasn’t scared by the game—at one point, late in his Let’s Play, his wife and a friend enter the room to say hello and he completely freaks out, telling them that they really cannot do that. But Odd’s reactions didn’t pre-empt my own. Notably, he doesn’t use a scare-cam, meaning I could see all of the screen and not be distracted by his face. I could be scared along with him, while also allowing his reactions to give me some distance from the game. Odd says in his first episode that he likes to set the mood when he plays scary games. That means turning off all the lights, putting the headphones on, and turning the volume up just a little too loud. The result? Odd was often startled by even small things, like creepy mannequins in his peripheral vision. In a weird way, it was nice to watch something scary along with someone who was also clearly scared. Some of Odds updates are short because he says he’s freaking out too much and needs to take a break. You can hear him breathing hard, his voice quavering a little. I certainly believed him. 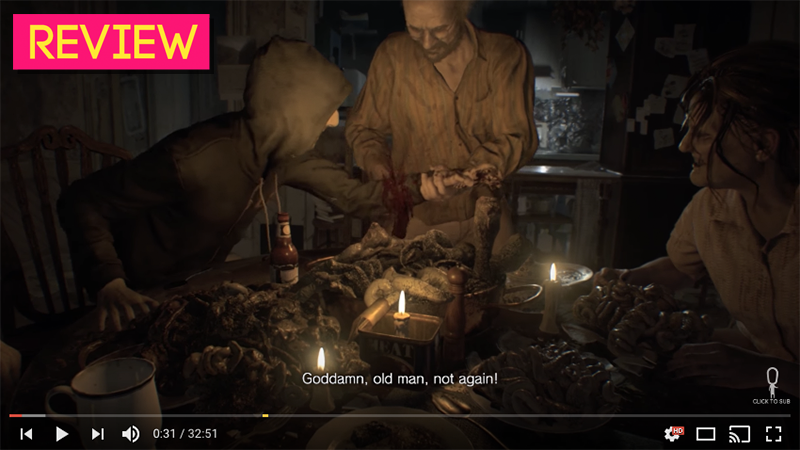 As a viewer, it’s easy to get drawn into the zombie mystery of Resident Evil 7, which focuses on Ethan Winters trying to find his wife, Mia, who has been missing for three years. Narratively, the game does a good job of placing the player and viewer in an extreme, but intriguing, situation. Hard to be bored by being trapped in a house by murderous cannibals, that’s for sure. Odd also vocalized his theories as he played, an aspect that is important to the identify of a modern horror game. Near the end, Odd correctly guesses the secret of the identity of Eveline, the spectre haunting the Baker farm, and I felt a completely unearned sense of pride. I found the gamier elements harder to watch. You know what’s really frustrating? Watching someone else solve puzzles, and not being able to give any input. I could feel myself tensing up, wanting to scream, It’s over there, you dingus, every time he missed a major clue. I know for fans, the return of puzzles is something that they celebrated. And I also know that puzzles are very fun—but not when you are watching someone else work through the steps you may have already figured out. I was definitely at an advantage because I wasn’t scared to death, but knowing that I was in a privileged position didn’t make it any easier to watch. I found myself pulling out my phone to play Dots & Co when hang-ups like a puzzle or boss fight happened, though I was still engrossed overall. A lot of video game plots fall apart if you think about them for too long, but Resident Evil 7 works just well enough that I could suspend my disbelief. Elements of Southern Gothic literature are exaggerated in the game to the point of grotesquery. This is not just a Louisiana bayou—the very environment is hostile to you, buzzing with wasps the size of cats. Your hosts are obsessed with hospitality to the point of wanting to kill you for not eating their food. It’s like a perverted cousin of Flannery O’Connor’s short story, “A Good Man Is Hard To Find.” After setting these conventions up, though, the game turns them on their head. One character insists the Baker family wasn’t always a scary coven of swamp dwelling creeps, but instead a generous and kind family that lost their way. Later, Jack Baker is given a genuine moment of humanity that is touching, redeeming himself and his family somewhat. It’s not Nobel Prize for Literature material, but it was enough for me. I once had a boyfriend that made fun of me for watching Let’s Plays, saying I’d have a fuller experience if I just played the game, but I don’t think that’s true. Like my coworker Luke Plunkett, I feel like I’m physically incapable of playing horror games, on a brain-wiring level. Even if I had somehow, through the aid of anti-anxiety medication, finished the game, I don’t feel like I’d have gotten as much out of it as I did through watching an LP. It’s like watching a movie with a friend and then sitting down for a drink to talk about it afterward: their experience complements yours, and fills out some pieces you may have missed. It’s no wonder millions of people choose to watch horror games on YouTube instead of playing them.